Twenty-four days into food journaling and there’s definitely some things I’m noticing. One, I definitely got comfortable with grains again. I don’t think this is a problem, but like I mentioned the last time, I’m having to make an effort to get in green vegetables more than I ever had before, but it’s getting easier. I like a variety of vegetables so that’s not the problem – it truly comes down to planning. Since I’ve been a bit more structured, my grazing has been more controlled, but I’m still giving myself some wiggle room. However, there’s next steps that will be taken this coming week. This is the slow implementation of a new routine. What was your favorite meal this week? 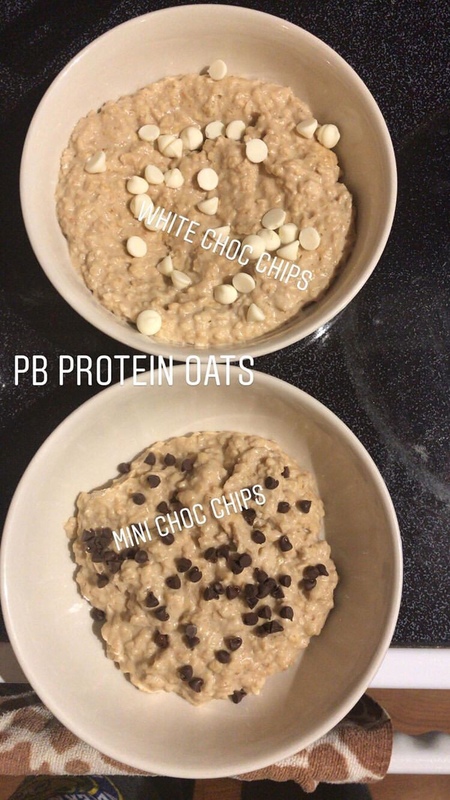 Protein oats with mini chocolate chips was my favorite. It just hit the spot. Did you notice if you were leaning toward one kind of food over others? I definitely am still leaning more toward carbohydrates as a whole, but I’m shifting better from grains to vegetables or at least have a better mix of the two. Protein needs to be a little higher and I know that’s going to take more planning. Did you hit your vegetable/fruit goal? Close, but no. Honestly, while I was in prep it made sense to have some broccoli as a snack or something, it’s not something I’m interested in right now. I do think I need to look at my snack options because I do love raw veggies as snacks, but never think to have them prepped for snacking. Did you feel like you ate enough or too much on average? I think I was eating at maintenance and that’s not the goal right now. I’m feeling really good, but I know that either nutritionally something needs to change a bit or activity needs to change a bit. Did you drink enough water? Yep! How was fiber this past week? So much better than the first week. You’ve been journaling for 3 weeks, what is the next step? I think I need to start more structured meal planning. While we eat a routine for breakfast, we’ve been winging lunches and guessing dinner. I think if I plan out breakfast and lunch I’ll be able to stay in a deficit a bit easier. It’ll also give me a chance to see where wiggle room is. Did you get to the gym all the days that you said you wanted to? No, I missed one. I did get to walk a lot this week and my back feels better. My knee felt a bit weird on Friday and I think it’s partially from sitting so much regularly. I’m thinking a may get a standing desk for the home office or at least use a box so I can sit and stand when I work for extended periods of time. What will help you get to the gym next week? Actually stopping work when I say I will. I’ve already scheduled my workouts, and I’ve also blocked out specific time slots to get specific pieces of work done. While I also have work blocked off, I haven’t assigned specific tasks in a while. How do you feel about new workouts next week? I’m excited. The movements I’ve been doing feel pretty good, and there’s not a ton of change up, but some adjustments for repetitions and weights. I would also like to bring back some movements I haven’t done in a few weeks. How do you feel about how much activity you got in this week? It definitely could be better. I had the same number of steps this week as I did last week, which is down about 6K from the week before. While having a high number of steps doesn’t equate success I know it’s reflective of my daily general movement. My back and knee are feel better, but like I mentioned I noticed that the sitting is causing a problem. My step goal is about 8K a day, but if I can hit around 6K I’d be pretty happy. The variance is great with my lowest day at 3400 steps and my highest around 10K, so I’d really like to have some consistency. How was sleep this week? It was ok. Some nights I felt right asleep, but there were two nights that I couldn’t fall asleep and I went into the office and worked until I was tired. Are you on your period or near ovulation? Ovulation was last week, but I’m experiencing some breast tenderness. According to my tracker, my period will be here in about 9 days. How did you manage stress this week? I journaled, I danced, I emailed my therapist, I blogged, I texted a friend, I cried, I napped and baked a cake. Was there anything that you’ve done in the past to work through stress that didn’t help? Journaling didn’t do what I wanted it to so I danced. It felt silly at first and then it felt normal. We did our grocery shopping last night since we knew we would be busy today. We also worked on a loose meal plan i.e. we’ve planned out breakfasts for this week as well as lunches. We also have some ideas of what we want to have for dinners like chicken or ground turkey, but the next step really is to make a meal out of those foods. So on Monday we know we’re making turkey burgers for dinner and Tuesday will probably be tacos or burrito bowls. I have some intentional flexibility. I’ve written out categories of sorts that I want to hit – green vegetable with dinner or fruit or starch vegetable with lunch – those kinds of things for this week. For April, I do think having more structured meal planning will be helpful and that will give me the transition into a fat loss environment that I want without being hyperfocused on the calories, but instead having more diversity and making an effort to shift my carbohydrate sources from primarily grains that can be calorically dense to a better balance including voluminous vegetables that help maintain satisfaction while helping decrease caloric consumption. The countdown continues: 81 days.